Looking for a place to stay? We've got you covered. From rustic retreats surrounded by ponderosa pines to modern amenities close to local eateries, Silver City has it. You can rest easy here. 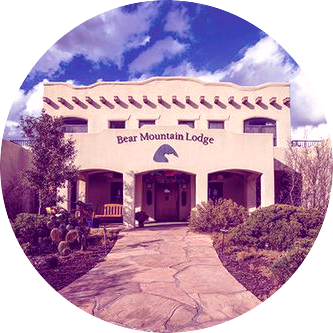 Be their guest at the fabulously unique Bear Creek Motel & Cabins in breathtaking southwest New Mexico! Their sauna facilities, combined with the serenity of the surrounding forest, provides visitors with a relaxing, spa-like experience. The 100 percent non-smoking Comfort Inn hotel in Silver City is located only minutes from WNMU and historic downtown Silver City. 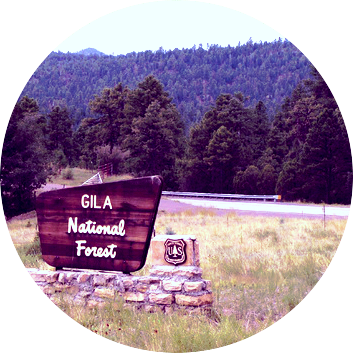 The Gila National Forest, just one of Silver City’s popular year-round attractions, is a short drive from the hotel, and Lake Roberts and the City of Rocks State Park are less than one hour away. Welcome to the Copper Manor Motel in Silver City, conveniently located in the center of town on Highway 180 East/Silver Heights Boulevard, near the intersection of US-90 and Highway 180 East, just a short jaunt from downtown. Their motel features sixty-eight rooms with exterior corridors. This conveniently located Silver City motel is in the process of remodeling, as well as adding additional amenities for visitors to enjoy. Free high speed WIFI and free breakfast are just a couple of the perks daily guests can expect currently, with more improvements to come in the future! Find the comfort you are looking for at the Econo Lodge in historic Silver City. Guests enjoy a complimentary hot breakfast from 6 to 10 a.m., a wonderful indoor heated pool and spa, with an adjacent fountain courtyard. Also, the hotel features laundry amenities, a fitness room, and a business center. 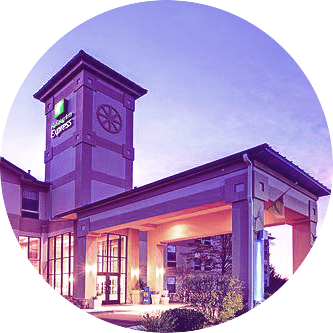 The Holiday Inn Express in beautiful Silver City is your ticket to a Southwest adventure. Let their friendly staff aid you in exploring the wonders of the Silver City area from a convenient homebase that features a fully equipped cardio workout room, an outdoor saltwater pool, complimentary Express Start breakfast, and free high speed internet access in every room. Nestled in the peaceful pine forest, Lake Roberts Motel is located in the Lake Roberts area of the Gila National Forest in southern New Mexico. Their recently renovated guest rooms now boast a beautiful Southwestern flair! Located only minutes away from WNMU, the Historic District in downtown Silver City, and the Gila National Forest, Motel 6 welcomes visitors looking for a convenient place to rest their heads. Guests will enjoy free morning coffee, as well as WIFI, during their stay. First opened for business in 1938, the Murray Hotel has maintained its original Streamline Art Deco style, while bringing the guest experience up to 21st century standards. In the center of Historic downtown Silver City, room occupants have a variety of interesting downtown views. The Murray Hotel has queen rooms, king rooms, and suites available. The hotel's eighteen charming guest rooms and suites are reminiscent of a small hotel in the European tradition. As a guest, your day will begin with a complimentary continental breakfast in the upstairs skylit room - an extension to guests rooms which can be used for intimate conversations, quiet reading, or making new friendships. Their Ailman room is available to guests for meetings, reunions and more. Providing a solid deal for a simple stay, the Inn in Silver City is just what you're looking for. Conveniently located near WNMU and the downtown Historic District, this pet-friendly hotel in Silver City gives you easy access to local sites, activities, and attractions. Bear Mountain Lodge, fully restored and lovingly maintained, features inviting common areas, a dining room serving breakfast and dinner, a well-stocked library, and eleven comfortable guest rooms with modern amenities. They are also home to Blue Dome Gallery, Silver City’s premier contemporary art space. 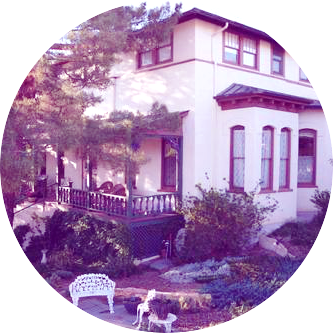 Carriage House Cottage is a Bed & Breakfast vacation rental located in the heart of historic Silver City. Whether your visit is for pleasure or business, we think you will find Carriage House Cottage meets your needs. Casitas de Gila Guesthouses is a Sunset Magazine “Top 10 Hidden Getaway” and one of Fodor’s “239 Great Places to Escape to Nature”. 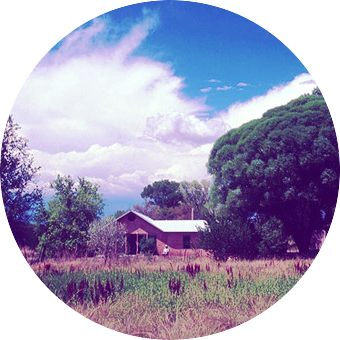 Perched on a bluff overlooking the Gila Wilderness and free-flowing, year-round Bear Creek‚ the Stress-Free Zone of Casitas de Gila Guesthouses and Art Gallery makes a perfect base for enjoying the beauty of the entire Southwestern New Mexico area. D and D’s Organic Haven delights in treating our guests to a simple, retreat-like atmosphere. We are happy to offer our self-built straw bale and adobe home and guest rooms as a healthy and relaxing get-away. 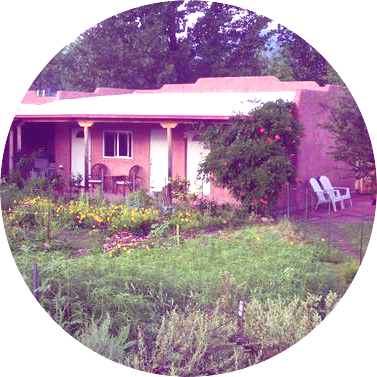 Our self-catering, Bed & Breakfast guesthouse was constructed in 2003 in the local New Mexico small pueblo style. Situated on 85 acres, at almost 5,000 feet, at the end of a working generational ranch, there are hills and river beds to wander. Stay at the Silver Creek Inn, a rare two-story adobe structure built by Frank Lauderbaugh circa 1885. The old adobe building has been renovated and restored by Stan King, who arrived in Mogollon in 1980. Retreat to an area of openness and art, to talking creeks and creaking stairs, to a town of population 15 and a tradition of southwest hospitality. Our 100-year-old Lodge was originally a school house in Hurley, New Mexico. 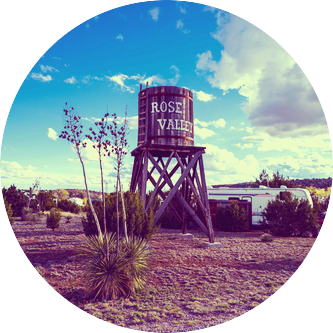 In the 1960’s, a man named Coy Rasberry single-handedly dismantled and moved it to Gila Hot Springs. Nowadays, you can enjoy the rustic charm of this old school house as a unique Bed & Breakfast. Take a relaxing soak in one of our hot pools, fed from the nearby hot springs. Adobe Agave is a charming short term vacation rental and Bed & Breakfast with 5 cozy individual suite apartments in a 100 year old adobe building located within walking distance of Silver City's Downtown Historic District. Enjoy all the comforts of home in a beautiful setting. The Agave House has unique architecture, beautiful furnishings, and complete amenities. Two bedrooms accommodate four adults, and we can make arrangements to sleep more. Come be our guest at the fabulously unique Bear Creek Motel & Cabins in breathtaking Southwest New Mexico! Our new sauna facility and the serenity of the forest that surrounds you, gives our facility that spa like atmosphere you are looking for. Filled with interesting art, internet, microwave, t.v., dishwasher, washer/dryer and the other essentials to comfortable living, this vacation home will help you feel at home away from home. Casa del Mosaic is Silver City artist Cecilia Stanford’s home and studio part of the year, and filled with her collection of eclectic art and crafts, as well as her own mosaics. 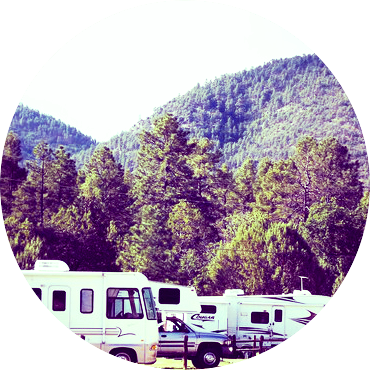 The Continental Divide RV Park is situated in the middle of an apple orchard, 6 1/2 miles north of Silver City on Highway 15 in the historic town of Piños Altos, which is also part of the world famous Tour of the Gila bike race circuit. Elevation of the park is just over 7‚000 feet. There’s nothing quite like the exclusive Georgetown Cabins. It’s the complete getaway as well as the ultimate hideaway – where privacy is as much a part of the experience as the total immersion into nature. 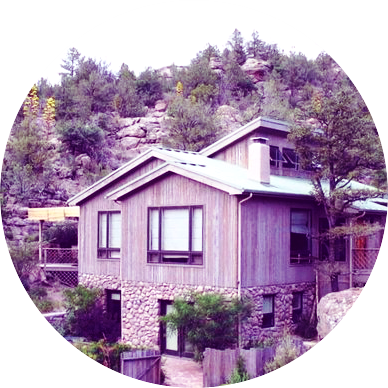 Situated in the Gila National Forest on six wooded acres, two miles from the Continental Divide Trail, Gila Hideaway is a three-bedroom, two-bath home that is perfect for romantic getaways, family vacations or business retreats. Come and retreat to a quieter time in the Guest House. Includes: 2 BR house‚ deck‚ grill‚ internet service‚ satellite TV‚ pet friendly. High-Lonesome Guest House offers a two bedroom, one bath, fully-furnished adobe casita. The main house on the property houses our High-Lonesome Bookshop with new and used books about the west, hunting and fishing, natural history, country living and local history. 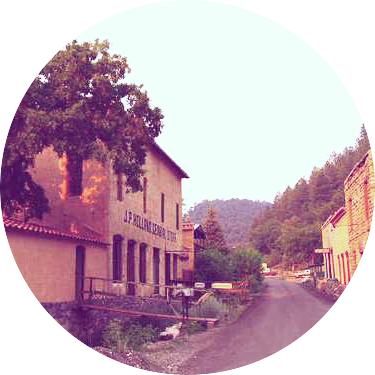 La Casa de Oro‚ or The Golden House‚ is a charming cottage in the village of Pinos Altos‚ just 6 miles north of Silver City at an altitude of 7‚000 feet. Enjoy our fully furnished cabins with full kitchens within walking distance to scenic Lake Roberts. Our widely different cabins sleep from 2 to 5 guests. Los Olmos Lodge is dedicated to providing an escape to the tranquil, mountainous landscapes of Glenwood, New Mexico. Each cabin is authentically tailored to meet a variety of your needs. Our lodge allows families the luxury of relaxing their minds and embracing everything the Wild West has to offer. A historic adobe bunkhouse apartment located at the Lyons-Campbell Ranch Headquarters, a New Mexico Historic site, and also on the National Registry of Historic Places. Perfect for a couple, featu​ring a king size four-post bed, air conditioning, full kitchen, satellite TV, and private marble bathroom with Jacuzzi. At the NAN Headquarters your home at our home may range from the humble Bunkhouse Cabins to the luxurious, exquisitely decorated western bungalow-style Rancher's House and the group-sized Lodge. Our rustic – looking cabins fit in with the Ranch’s Old West feel, but you’ll find clean, comfortable and modern accommodations inside. For a couple of nights, a week or longer, our cabins are a great way to enjoy our corner of New Mexico from your car, motorcycle or other vehicle. Our fully-furnished Lodges have all the comforts of home with full bathrooms, cooking facilities, cable TV and Wi-Fi, heating and air-conditioning. Unlike a motel you can cook out and enjoy a camping experience. Silver City RV Park and Cabins is located right in the heart of downtown Silver City, New Mexico. Even though we are in-town, we have a quiet, secluded atmosphere with huge shade trees throughout the park. Nestled back in the juniper trees at 6200', you will find a new, fully furnished getaway. The one bedroom cabin has a living area and full bath. The kitchen is completely furnished with dishes. 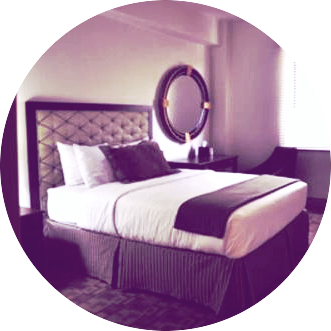 The West Street Inn offers a variety of elegant short term rentals for Silver City visitors. Located in the heart of Silver City the West Street Inn is within walking distance of Western New Mexico University and the historic downtown area where restaurants, art galleries and shopping abound. Here you are close to everything the Silver City area offers while enjoying the privacy of your own fully furnished guest apartment or house. Wildwood provides a quiet and secluded, beautiful, twenty-five foot, round, straw bale Hogan with double futon bed, padded wood floor and an open floor plan for individuals or group activities. No children or pets allowed in the Retreat Hogan. The Bighorn Campground is a convenient campground just one-tenth of a mile northwest of the town of Glenwood. It is a campground that is typically used more for short-term stays (1 or 2 days) than long-term camping (14 days). It is within walking distance to the town of Glenwood and the closest designated campground to the Catwalk National Recreation Area. The landscape is mostly pinon and juniper trees. Includes: 6 sites for tent or trailer camping; toilets‚ picnic tables‚ no electric or water. 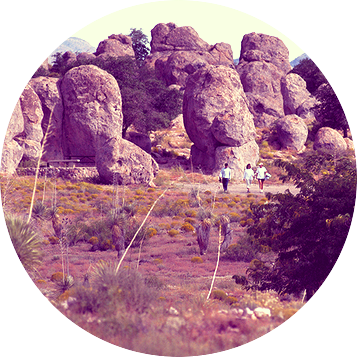 Located about halfway between Silver City and Deming, City of Rocks offers camp sites, hiking trails, excellent mountain biking, wildlife viewing, birding, stargazing, picnic areas and a desert botanical garden. The uniquely designed, new Visitor Center includes a large display area and modern restrooms with hot showers. City of Rocks State Park is your official sponsor of adventure! The area provides habitat to many rare and unusual birds including Bell’s vireo, peregrine, bald eagle (in winter), golden eagle, black hawk, zone-tail hawk, Grey hawk, yellow-billed cuckoo, Gila wood pecker, and Abert’s towhee. The river provides opportunities for canoeing or rafting during spring runoff, hunting, and year-round fishing and camping. The river contains smallmouth bass and several species of catfish. The Gila is 3.3 million acres of forested hills, majestic mountains and range land. It is probably best known for its wilderness areas, in particular the Gila Wilderness - the first wilderness in the United States. The magnificent mountain scenery, cool summer temperatures and relatively warm winters permit a wide range of recreational opportunities during all seasons. 12 spaces w/ full hookups‚ 30 amp service‚ laundry‚ 1 shower‚ quiet and shady. Nestled in the foothills of the Burro Mountains and Gila National Forest in New Mexico, you’ll love the gorgeous setting, the exhilarating activities and the overall rural location of the historical property, Burro Mountain Homestead, a New Mexico RV and lodging destination park. 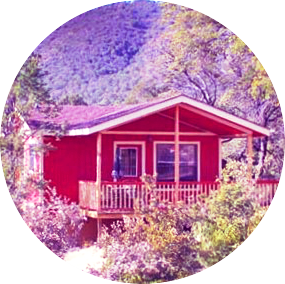 Come and visit the great outdoors of Glenwood, New Mexico, and stay at an authentic homestead. 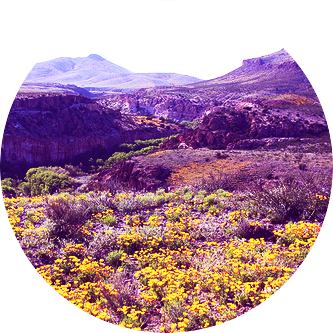 You’ll enjoy great scenic grounds with oak trees, beautiful blooming flowers, and fantastic views of the Gila Wilderness and Mogollon mountains. 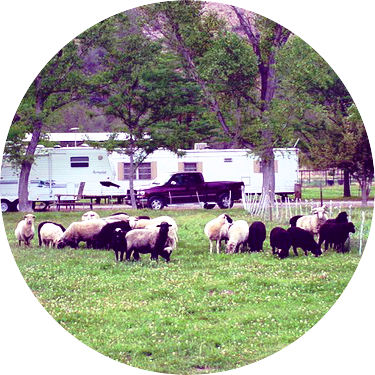 Whether you are camping in a tent or full-size recreational vehicle, there is a place at the Gila Hot Springs ranch. Owned and operated by Becky Campbell, this facility is an AAA rated campground. We are committed to make sure that your camping experience is an enjoyable success. 18 Hookups; 10 are pull through - all with a view! Surrounded by trees, nature and tranquility only minutes from shopping, restaurants, movies, etc. We are a small 20-acre RV Park, 13 miles south of Silver City, right on Highway 90. Includes: 21 full hookup sites‚ some pull-through‚ w/ picnic tables. Sundial Springs is perched above the San Francisco River adjacent to the Gila Wilderness. Secluded and surrounded by National Forest, we offer a camping experience unique to even the most seasoned traveler. We welcome campers of all kinds: RV, Tent, Motorcyclists, Bicyclists, Airplane Campers, and River Runners. (Shuttle Services available) Includes: RV park‚ tent sites‚ hot springs. Silver City is a gem in Southwest New Mexico with forest recreation, a vibrant historic downtown, art community, and dozens of festivals and events. This website is brought to you by the Silver City Arts & Cultural District and is funded by Silver City Lodger's Tax.